The first in a series of Raspberry Pi Zero tutorials and projects. Like most people, I'm a fan of the Raspberry Pi Foundation and what they are trying to do, but also like most people... I'm forever wanting more from the Pi. I actually think its rather cripiling that they don't include wifi in every model given how connected our world has become...but thats a topic for another time. Power Consumption can be as low as 80mah idle. $5 bucks!! !, though you'll need some peripherals to get started. Requires a few peripherals, so its not really $5 but more like $15 - $20. Here you can find all the parts used throughout these tutorials, I've tried to mark the ones that are required for the basics vs ones for special projects. A USB Hub (~$7) - Required For All Tutorials but may not be needed after initial configuration. USB Keyboard (~$17) - Required for initial setup. I prefer this small one because I use it for many projects just to get SSH up and running then I use my regulard computer. Mini HDMI to Female HDMI (~$10) - Required for initial setup unless the project drives a display continually. MPU-9255 Tutorial - 9-Axis Accelerometer w/Compass via i2c from Python. 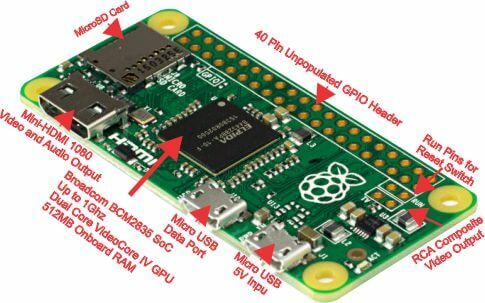 This section will walk you through installing an OS on your PiZero. This instalation procedure is based on Adafruit's guide, their wiki has imensely helpful to many of my projects. I encourage everyone to check it out and support them. Download Raspberry-PI-SD-Installer-OS-X from this git repo. Ray Vijoen has created a useful script to handle much of the sdcard formating and initial installation for you on MACthat makes it really easy to make an SD card using a Mac. Alteranatively, you can use a Apple Pi Baker to setup your SD card, and make backups once you have your Pi setup the way you like. Connect a USB Hub to an OTG Cable that goes to your Pi's Micro USB OTG Port. The plug your USB Wifi Dongle and Keyboard into the hub. Now you are ready to power up your Pi via the other micro USB port. Lastly, plug in your mini-HDMI to HDMI adapter as well as your HDMI cable for your monitor/tv. Power on your Pi and once the loging prompt appears log in using the username: pi and the password: raspberry. You'll want to change the password at some point but I'll leave that up to you to decide. Once you are at the command prompt you'll want to setup the wifi so we can switch to using SSH instead of having the pi cabled directly to our monitor and keyboard. You may need to edit your keyboard mappings if you notice that the double quotes you type show up as @-signs. This can be done by running sudo dpkg-reconfigure keyboard-configuration and following the instructions to switch to a US keyboard. This will mostly likely require a reboot to take affect fully (it did for me). Now that you have your keyboard working, you can edit your interfaces file to look something like the below. Now lets see if your network interface came up as expected. You can do this by running ifconfig, if it worked your should see wlan0 with a valid IP Address like the one below. Now lets install ssh by running sudo apt-get install ssh. Once this completes, you should be able to ssh to your pi from another machine.